Today, January 13th 2014, Emily and Jessica are 15! 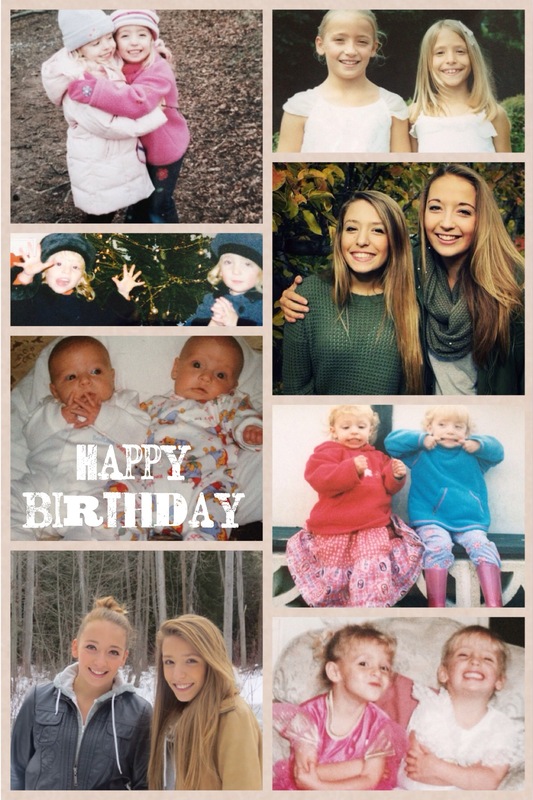 Happy Birthday beautiful girls – I remember being 15 and thinking I knew it all. Honestly, really believing it. I was so sure that I could leave school at 16 and rule the world. I was also reminded on the way to school today that the twins are one year away from driving (*insert nervous laughter*). Birthdays! On the way to school Jess asked me ‘Why are you so excited about our birthday Mom?’ I said this… give or take a few words. “Birthdays need to be celebrated. I think it is more important to celebrate a birthday than a successful exam, a promotion, or a victory. Because to celebrate a birthday means to say to someone: ‘thank you for being you.’ Celebrating a birthday is exalting life and being glad for it. On a birthday we do not say: ‘thanks for what you did, or said, nor accomplished.’ No, we say: ‘Thanks you for being born and being among us.’ On birthdays we celebrate the present. We do not complain about what happened or speculate about what will happen, but we lift someone up and let everyone say, ‘We love you.’…Celebrating a birthday reminds us of the goodness of life, and in this spirit we really need to celebrate people’s birthdays every day, by showing gratitude, kindness, forgiveness, gentleness, and affection. These are ways of saying: ‘It’s good that you are alive; it’s good that you are walking with me on this earth. Let’s be glad and rejoice…” Henri Nouwen, Here and Now. So girls as we enter into this important year. I pray you will know how much you are loved unconditionally, by us and more importantly by God. I pray you will look in the mirror of your soul and see beauty by God’s standards. I pray you will know the knowledge of God singing over you. I pray you will learn to hear His voice – and respond. Know that you are called, unique and gifted. Know that you have God given purpose and destiny. I thank you God for amazing mentors around you both. I thank God that He has entrusted us with you. I thank God for you! And for me Lord…as you see, this parenting is not ever, I mean, not always easy. Help me to respond not react. To know daily that Emily and Jessica are not ‘teen me’ (phew). Teach me that yolo’s are a gift, and one that I could use a little more often. That taxi-ing all over town, all the time, to many different friends, is also a gift. Lord, give me wisdom. I will be praying this a lot… Amen. Did I mention wisdom? Ps. Don’t forget the letter I wrote to here!